Markel Corporation released fourth quarter and full year results for 2015 earlier this week. Although the annual report will not be released until later this month, there are enough details in the press release to form some initial impressions. We previously discussed Markel in June 2015 when the share price first exceeded $800. Markel’s book value per share was $561.23 at the end of last year compared to $543.96 at the end of 2014 which represents an increase of 3 percent. Book value growth was held back in 2015 primarily due to a decline in the equity and fixed income investment portfolios. However, over the past five years, book value per share has grown at a more satisfactory compound rate of 11 percent. Management evaluates the company’s progress based on growth of book value per share on a five year rolling basis. Over the past ten years, Markel has slowly diversified into a number of non-insurance operations in an attempt to emulate the model that has worked so well for Berkshire Hathaway over the past half century. However, we still view Markel as primarily a property-casualty insurer. Insurance underwriting takes center stage when evaluating results. Markel’s consolidated combined ratio was 89 percent in 2015 compared to 95 percent in 2014 driven by more favorable development and a lower current accident year loss ratio. The combined ratio is a key metric for any insurance company since it represents the percentage of earned premiums that are consumed by loss and loss adjustment expenses, policy acquisition expenses, and operating expenses. A combined ratio under 100 percent, when sustained over a long period of time, demonstrates discipline and skill on the part of underwriters. When underwriting is profitable or break-even, all of the policyholder “float” – that is, premiums collected by Markel in advance of payments made to policyholders, can be invested in fixed income or equity securities at no cost. As we can see from the press release, the combined ratio of all of Markel’s underwriting segments improved in 2015. A significant driver of the improvement in 2015 involved “favorable development” which refers to re-estimating ultimate losses for prior years. A great deal of management discretion is involved in estimating ultimate liabilities for policies where claims may be unknown for several years. As a result, it makes sense to look at the track record over an extended period of time. 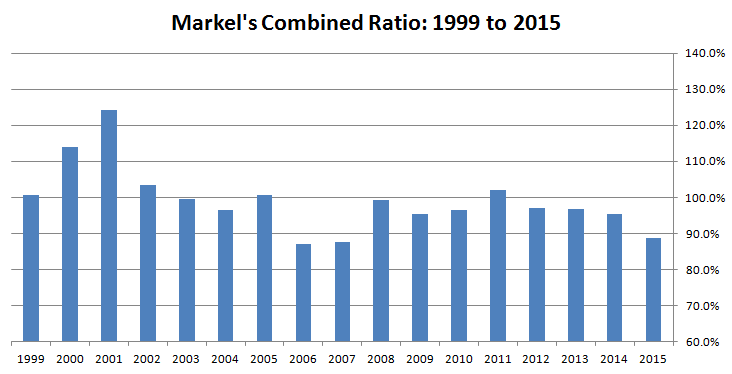 The exhibit below shows Markel’s combined ratio from 1999 to 2015. Investors can debate the meaning of “long term” but a large majority would probably consider a track record of this length to be significant. The combined ratio only slightly exceeded 100 percent for three out of the past fourteen years. The addition of the Alterra reinsurance business in 2013 did change the composition of Markel’s book of business but initial results appear to be favorable. Markel’s investment results for 2015 were comprised of net investment income, realized investment gains, and unrealized investment losses. Net investment income for 2015 was $353.2 million which was down slightly from $363.2 million in 2014. The decline was due to lower bond income primarily driven by unfavorable foreign exchange rates which depressed results for foreign interest income when translated into US Dollars. Realized gains of $106.5 million exceeded the $46 million reported in 2014. $44.5 million of write-downs for other-than-temporary declines in equity securities were included in 2015 results. In general, Markel’s investing philosophy is very long term in nature and the timing of sales of investments, and the resulting realized gains and losses, is not particularly meaningful for any given year. The company posted net unrealized losses of $320.5 million, net of taxes, in 2015 compared to a $661.7 million gain in 2014. These unrealized losses were due to declines in equity and fixed income securities. The full annual report and 10-K will be required to further analyze Markel’s investment results for the year. 2015 marks the ten year anniversary of Markel Ventures. Over the past decade, Markel has slowly diversified into a number of unrelated manufacturing and non-manufacturing companies that are either wholly owned or majority owned. Tom Gayner, Markel’s co-Chief Executive Officer, is responsible for capital allocation and oversight of the Markel Ventures companies with individual company executives responsible for day-to-day operations. This model is very similar to Berkshire Hathaway’s well proven non-insurance operating philosophy. Net income from Markel Ventures rose to $11 million in 2015 from $9.6 million in 2014 while EBITDA rose to $91.3 million from $81.3 million. Net income and EBITDA were positively impacted by more favorable results in manufacturing operations partially offset by headwinds in the non-manufacturing operations. The underlying results of the manufacturing operations were significantly better than the headline numbers appear to be. When Markel acquired Cottrell in 2014, a portion of the purchase consideration was based on Cottrell’s post-acquisition earnings through the end of 2015. Cottrell posted better than expected results in 2015 which drove a $31.2 million increase in the contingent consideration due to Cottrell’s former owners. One might assume that additional payments made to Cottrell’s former owners would be considered to be part of the cost of acquiring Cottrell and capitalized but that is not the case. Instead, this $31.2 million increase in contingent compensation was charged against earnings in 2015 which is a significant non-recurring distortion. In addition to the Cottrell distortion, Markel’s 2015 non-manufacturing results include a $14.9 million non-cash goodwill impairment charge related to the Diamond Healthcare unit. According to statements made in the Markel conference call, Diamond Healthcare has no remaining accounting goodwill on the books. Putting aside the question of whether Diamond Healthcare was a good acquisition in retrospect, with no remaining goodwill on the books similar charges are not possible in the future. When one considers the Cottrell and Diamond Healthcare distortions, it looks very likely that results for Markel Ventures in 2016 will show significant growth in reported net income and EBITDA. We did not explicitly account for the value of Markel Ventures in the valuation model presented in June. It looks like the value of Markel Ventures is going to be too significant to ignore in the future. The case we made for Markel’s long term appeal in June appears to be fully intact. Fluctuations in equity and fixed income markets make year-to-year progress in book value growth uneven but over the long run the skill and discipline of management becomes evident. 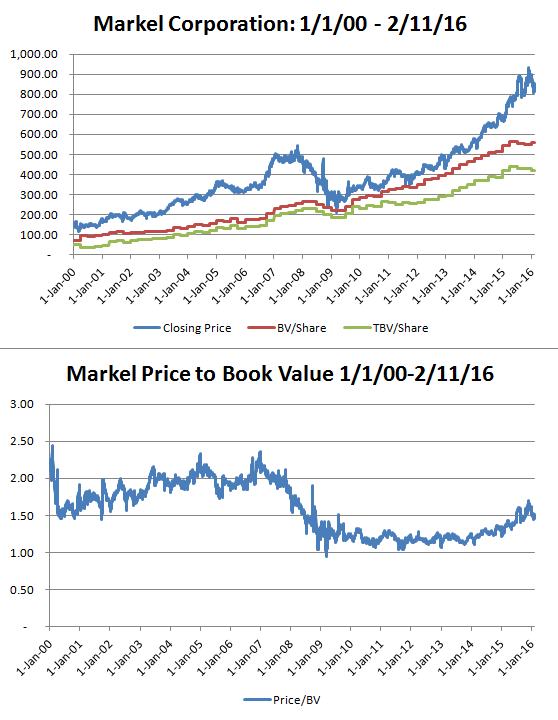 The exhibit below shows Markel’s daily share price along with quarterly book and tangible book value along with a chart showing the price-to-book value over time. We can see the steady progress in book value and note that the valuation on a price-to-book basis does not appear to be overly aggressive. For an insurance company, skill in underwriting is an absolute prerequisite when it comes to creating long term value and, more importantly, avoiding disaster. Certain insurers like Markel and Berkshire Hathaway take the value proposition a couple of steps further by investing policyholder float in equity securities and owning non-insurance subsidiaries. It will be interesting to see further details of Markel’s progress in the upcoming annual report. Disclosures: Individuals associated with The Rational Walk LLC own shares of Markel Corporation. Kewaunee Scientific Corporation: Rare Opportunity or Value Trap?